It is 2018 and I will be the first to admit that the year 2001 feels like only a couple years ago instead of seventeen. Time appears to move more quickly the older we get and that can feel unsettling. Time marches on and with it are the changes it brings. For instance, MomsClub playgroup plans have been replaced with group texts about how much, (or little), makeup is reasonable for a middle schooler to wear. And somehow I have migrated from a rural town in New Hampshire to a bustling suburb of Denver. These details of my life are the evidence of time moving me forward and with it the waves of change. A significant change that we all experienced and continue to see traces of today is the Great Recession of 2008. The after effects of the Great Recession has touched many facets of the American economy. Among the intangible things that have been impacted are the tangible treasures that we hold dear to us inside our homes. I am talking about heirlooms of monetary worth, fine art investments and our furniture. Furniture has won the spotlight for our biggest conundrum. 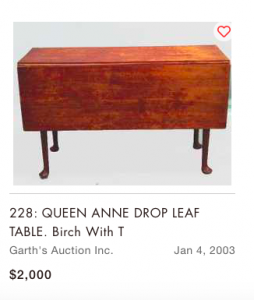 The value drop in furniture is so glaring that we avert our eyes from the disappointment. A generation of Baby Boomers across the nation are struggling with this news on a daily basis. In the auction and appraisal industry this is the “hard conversation”. Countless dining room sets of significant cost thirty years ago are a struggle to sell. It may appear that the only value furniture has accrued over the passage of time is emotional value. And, emotional value is as real as monetary value. How much quality time has one invested in gathering around the dining room table? How much laughter and how many tears did one’s dining room bear witness to over the consistent course of time. 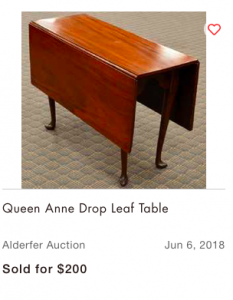 These are the things that a person feels are being discounted when they are told that the dining room table they spent the sum of several paychecks on will be sold for a liquidation price of $200.00. It is understandable to mourn the squelched expectations of a bountiful return on investment regarding our most cherished furniture. This is an experience of loss. Yet, in all forms of grieving we eventually arrive at a place of acceptance where we can pay respects and possibly experience gratitude. Marie Kondo suggests that you, “thank the item for the role it has already played in your life”, in her book titled “The Life Changing Magic of Tidying Up”. This strategy honors sad feelings and triggers feelings of gratitude. In addition to paying respects to the item, many people are reviving furniture. 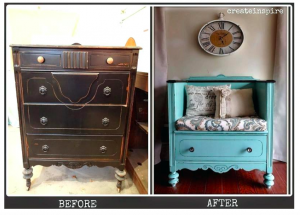 The chalk paint movement has been one way creative people rescue and revive discarded furniture, (don’t worry…it can always be stripped and restored later). 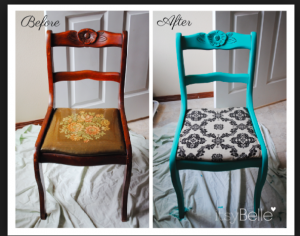 Another way people rescue furniture is by reincarnating the purpose of the piece: aka repurposing. Finally, we can always seek the family that needs what we have and wishes to love the dining room set that we have loved. The Furniture Bank Association of North America provides furniture to families struggling to furnish their homes due to financial hardships. Yes, the disappointment of our undervalued furniture is real and the challenge to sell most pieces is incredibly frustrating. However, we can move through this moment in time with grace and innovation. This too shall pass, but in the meantime we can choose creativity, charity and gratitude to be the memorial for what we have cherished. A very well-wriien article! Some excellent advice to those who may be downsizing, for whatever reason. Poignant thoughts about our memories and how the things that are a backdrop can keep the experiences so vivid. I have many memories conversations at the dining room table. . . The passing of time and a generation seems to happen in the blink of an eye.